The rich, mellow Rocambole hardneck Garlic of the Midwest. Harvests in early summer - stores through fall into winter. Paw Paw is rare because it is a full flavored mellow Rocambole with little or no hotness to the taste - excellent for Pesto. Paw Paw is a generally good sized and can be a rather large garlic. Its flavor is rich and mellow like shallots but almost buttery and not hot or spicy and a warm pleasant aftertaste sticks around for a while. A very enriching taste experience and not one to burn your tongue. From a grower's perspective, it grows well in cold winter areas and usually grows healthy surprisingly uniform sized bulbs. It has thick bulb wrappers for a rocambole and they have a lot of purple and brown layered across a white background - very attractive. Paw Paw usually has anywhere from 8 or 9 easy to peel cloves that are of good size, with no smaller inner cloves. The outer bulb wrappers are thin and flake off easily so it is not a very good storer, but no Rocambole is. 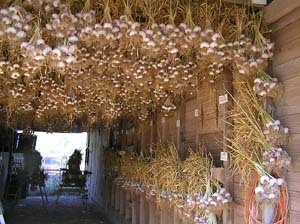 For those up north who want to grow their own garlic, it is said to grow well in wet conditions. It only takes a year or two to grow all you can eat. It harvests in early mid-season (Julyish) along with most of the other Rocamboles. Bulbs are usually over 2 1/2 inches in diameter and are of good size are grown primarily for their rich flavor and good growing characteristics. It's always best to grow some longer storing Porcelain or Silverskin garlics as well as Rocamboles so you can have garlic all year round.